Do not use dark rye or pumpernickel, which are coarser flours. Using them will result in a heavier loaf. 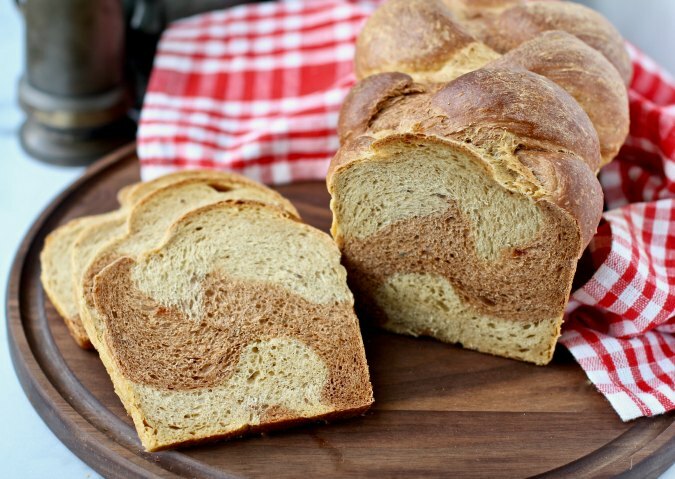 While you can't see it from the outside, this bread calls for two different colors of dough. The secret to making braided rye bread with two different colored doughs is make sure that the doughs are very similar in ingredients and rising time. 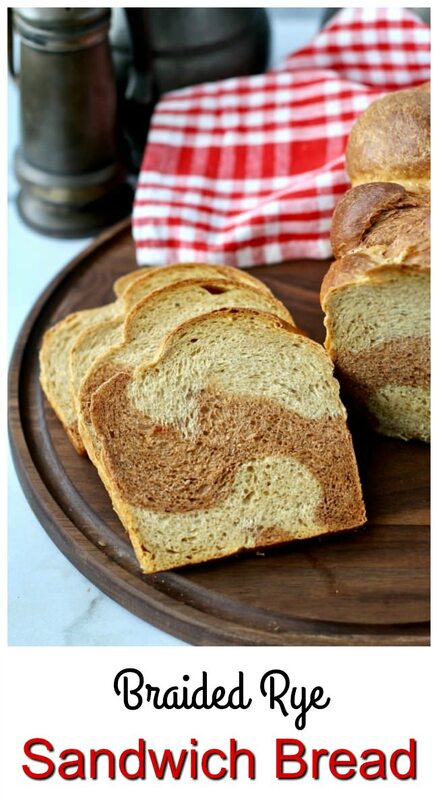 I always thought you made marbled rye with two kinds of rye, but that's not the case. You actually make two batches of dough that are exactly the same, but then you add a coloring ingredient such as caramel coloring, cocoa powder, or even instant coffee. My loaves aren't as "contrasty" as a typical marbled rye, mostly because I used molasses as the sweetener, which darkened the light dough. I also wasn't as heavy handed as I probably should have been with the caramel color. If you want to see more contrast in colors, check out my first attempt at marbled rye, I used honey for sweetening, and a lot more coloring for the dark half of the dough. Instead of marbling the bread this time, I decided to get out of my three-strand braid comfort zone and learn how to do a four-strand braid. After many attempts to figure it out, I finally did it! 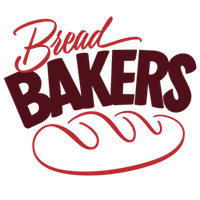 To create a four-strand braid for bread, simply label each position of the strands with a number, and following this pattern: 4 over 2, 1 over 3, and 2 over 3. The secret to braiding a four-strand loaf is that the numbers don't move with the strands. Instead, the strands change numbers depending on where they are placed. For example, the "4" strand becomes the "2" strand after you fold it over the "2" strand... which then becomes the "3" strand. I hope that makes sense!!! I always thought the number of the strand followed the strand, which is why I always ended up with a twisty mess. 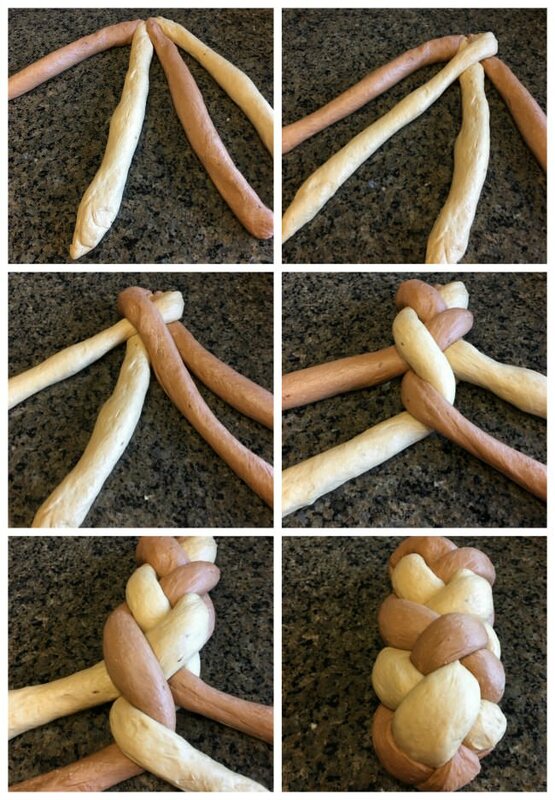 To create the four-strand loaf, divide the dough into four equal sized pieces, and roll them into ropes. Pinch the ends together with the tips facing you, and number the strands 1, 2, 3, and 4, from left to right. Fold the #4 strand over the #2 strand. Next fold the #1 strand over the #3 strand. Finally, fold the #2 strand over the #3 strand. Repeat until you run out of dough. Pinch the ends together and tuck them under. 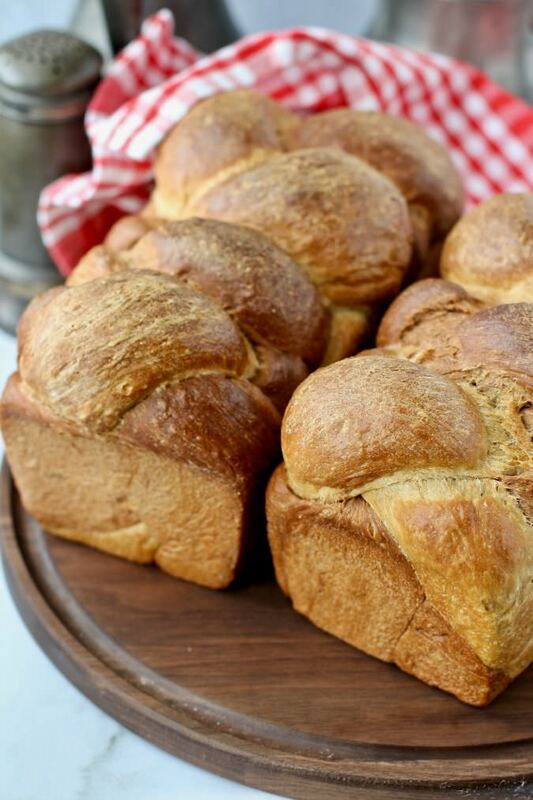 You can bake these loaves on a baking sheet or transfer the braid to a 9-inch by 5-inch loaf pan. For the darker dough, I used a product called Gravy Master, which is essentially caramel coloring. You can also use dissolved coffee powder, cocoa powder, or carob powder. You can also purchase caramel coloring from a restaurant supply store. Very Helpful Karen's Kitchen Stories Hint: Definitely make two separate doughs even though they are the same. 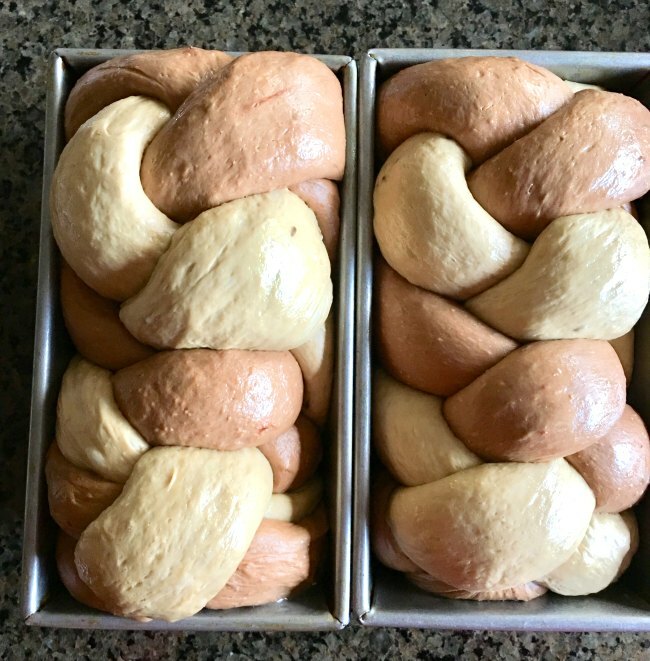 If you make a large batch of dough, divide it, and try to then incorporate the coloring, you'll end up with streaky dough like I did when I tried to color dough for these piglet buns. This rye bread does not taste at all like store-bought rye bread. It's much milder and softer than "deli" rye. If you leave out the caraway seeds, you may not even be able to tell that this is rye bread. Mix all of the ingredients for the first dough in the bowl of a stand mixer with the dough hook on low until the dough just comes together. Switch the speed to medium-low and knead for about 5 minutes until the dough is smooth. Transfer the dough to an oiled bowl or dough rising bucket, cover with plastic wrap. Make the second (dark) dough, adding the caramel coloring with the water and follow the same process as with the first dough. Let both doughs rise for about 90 minutes at room temperature, until doubled. Divide each dough in half and roll each piece into a 16 inch rope. Line the strands up, alternating a light and dark strand, and pinch the ends together. Number the strands 1 through 4, left to right. Place the braids into oiled 9 inch by 5 inch bread pans and cover with oiled plastic wrap. Let rise for 60 to 90 minutes, until almost doubled. Heat the oven to 350 degrees F while the dough rises. Bake the loaves for 45 minutes, until it reaches an internal temperature of 190 degrees F.
Turn the loaves out onto a wire rack and let cool completely. This recipe was adapted from The Bread Baker's Apprentice by Peter Reinhart. This book taught me how to bake bread. In fact, I've made every bread in the book. I am so absolutely excited now! Karen, can you believe I have a book on braided breads (the WHOLE book!) and it's on my plans to bake a braided bread also away from the "comfy-3-strand-braid" in the near future? And then I see your amazing production, and I am in awe! Thanks so much Sally! Six strand braid here I come lol! Beautiful bread, perfect to slater with butter or jam for breakfast.